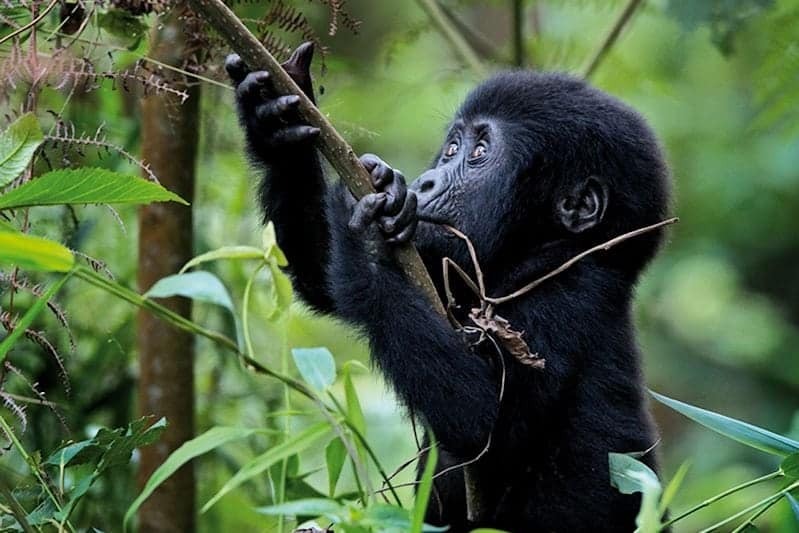 Visit the mountain gorillas in Bwindi Impenetrable Forest – located in the heart of Africa, in the corner of southwest Uganda, nestled between Uganda, Rwanda, and the Democratic Republic of the Congo. Bwindi Impenetrable Forest is located in the heart of Africa, in the corner of southwest Uganda, nestled between Uganda, Rwanda, and the Democratic Republic of the Congo. It comprises 331 square kilometres (128 sq mi) of jungle forests and contains both montane and lowland forest and is accessible only on foot. The Bwindi Impenetrable National Park is a UNESCO-designated World Heritage Site. The forest is one of the richest ecosystems in Africa and the diversity of species is a feature of the park. The park provides habitat for some 120 species of mammals, 348 species of birds, 220 species of butterflies, 27 species of frogs, chameleons, geckos and many endangered species. The park is a sanctuary for Colobus monkeys, chimpanzees and many birds (such as hornbills and turacos). It is perhaps most notable for the 340 Bwindi gorillas, half the world’s population of the critically endangered mountain gorillas. Meet and greet at 5:30am with your personal guide. At 8:00am you will arrive in Mbarara town for your breakfast at the Igongo Cultural Centre. You will continue for a scenic drive that allows you to enjoy the beautiful and varied country side. The road winds through a stunning mosaic hill scenery all the way to Bwindi. Arrive early enough for your lunch at the lodge in Bwindi. In the afternoon visit a local Buhoma Community Primary School – supported and managed by the Bwindi community members that thrives on support from visitors and community efforts. The school’s mission is to create awareness of the environment for sustainable development through quality education. Overnight stay at Buhoma Community Rest Camp. After a good and delicious local breakfast, hike to the park headquarters just 100 meters from the lodge for a briefing by the park ranger. 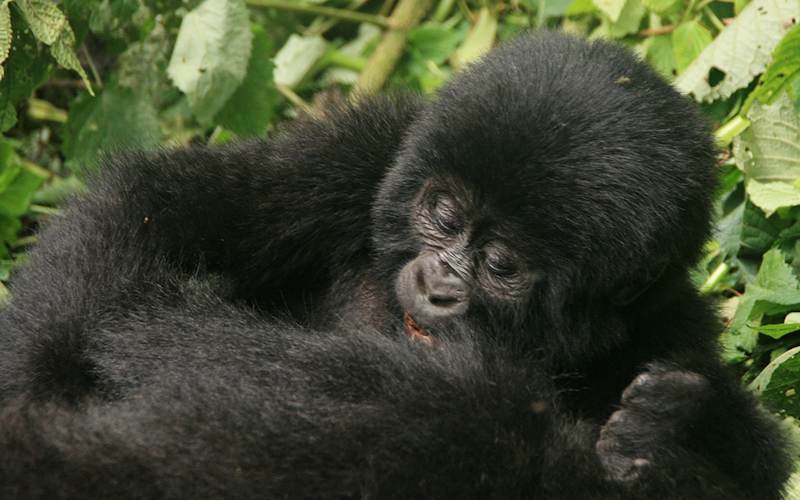 At 8.30am local time, you will be transferred to the starting point for the gorilla trek. 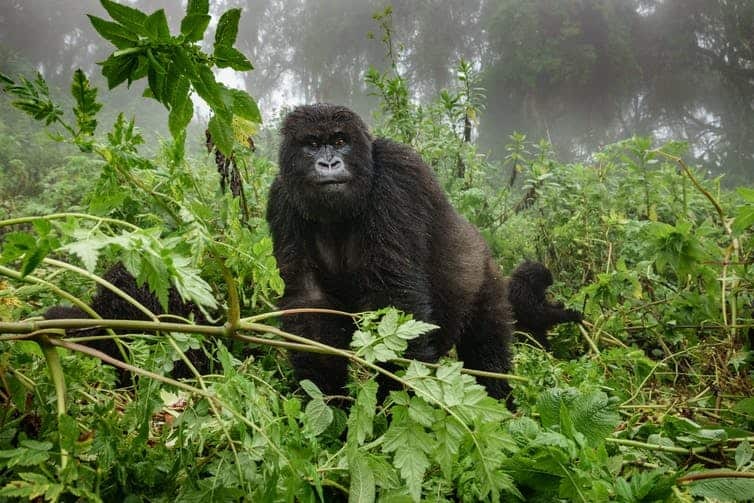 There are 3 habituated gorilla groups within the precincts of Buhoma forest area including Habinyanja (Group H), Mubare (Group M) and Rushegura (Group R). 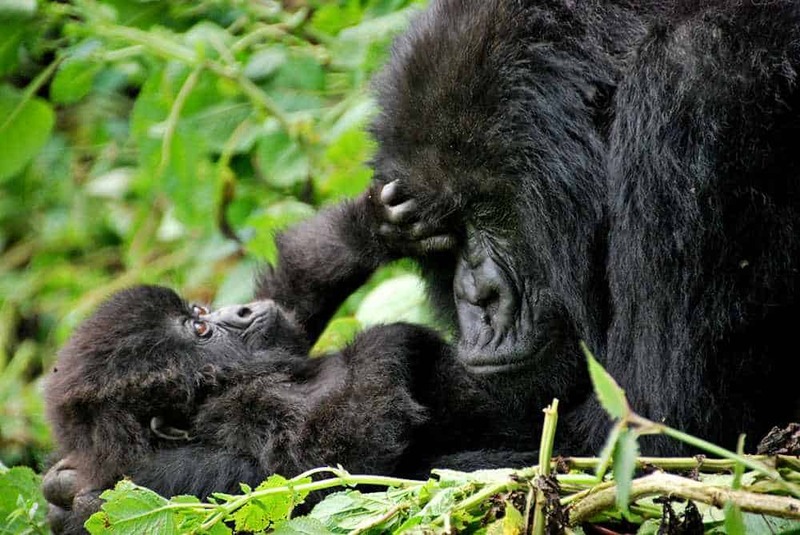 Gorilla trekking is a wonderful experience – one that a lucky few treasure for the rest of their. 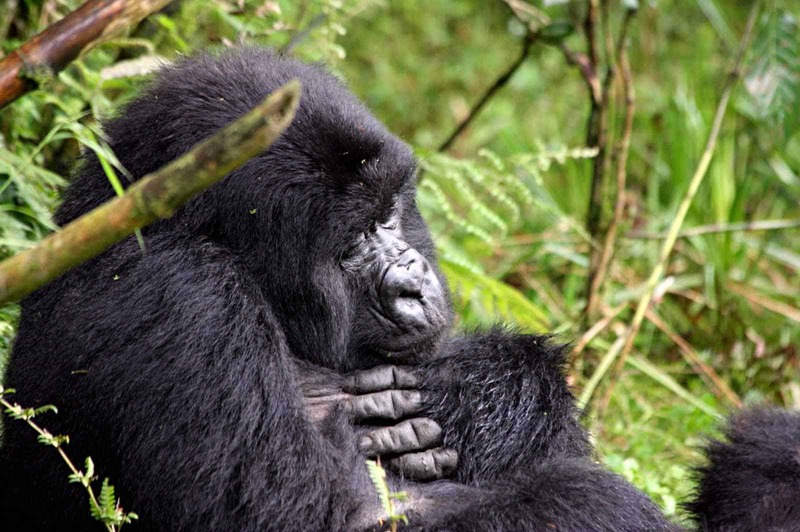 Visiting mountain gorillas can entail 3 hours to a full day trek through the forest. The expedition is led by experienced trackers who have spent their lives living in or close to the forest.The gorillas move from one place to another every day, looking for food. The visit will give you a glimpse into the life of a gorilla family and if you are lucky enough to gaze into the eyes of a gorilla, you may sense an immediate connection there. The famous gorilla researcher Dian Fossey wrote: “It was their individuality combined with the shyness of their behaviour that remained the most captivating impression of this first encounter with the greatest of the great apes.” If you are looking for a beautiful tropicalparadise, you can’t beat this. Time to leave the gorillas to their peaceful lives, in the rainforest.Return to the lodge for relaxation, sharing stories and sorting out photographs. In the evening you can go for a community walk – visit the Batwa pygmies who will be providing singing and dancing entertainment, local banana beer brewing and local fortune tellers. Return to the lodge for dinner and an overnight. After a well-deserved breakfast, it is time to go back to Kampala again. The sight of rolling hills, evergreen vegetation, crater lakes, tea plantations, forest and savanna grasslands – the spectacular hills and scenery will make you reluctant to leave! En route, you will find local communities popular for making drums and crafts as well as a fruit market. Stopover, admire and maybe buy yourself some souvenirs. Passing the equator linewill be another highlight of the journey–we will make a short stop to take photographs. We will arrive in Kampala in the evening. NB: For visitors who do not wish to travel long distances you are advised to arrive and depart from Kigali airport in Rwanda. The Bwindi Impenetrable National Park is in south-western Uganda and a United Nations Educational, Scientific and Cultural Organization-designated World Heritage Site. Species diversity is a strong feature of the park. It provides habitat for 120 species of mammals, 348 species of birds, 220 species of butterflies, 27 species of frogs, chameleons, geckos, and many endangered species. Floristically, the park is among the most diverse forests in East Africa, with more than 1,000 flowering plant species, including 163 species of trees and 104 species of ferns.The park is a sanctuary for colobus monkeys, chimpanzees, and many birds such as hornbills and turacos. It is most notable for the 340 Bwindi gorillas, half of the world’s population of the critically endangered mountain gorillas. Four habituated mountain gorilla groups are open to tourism: Mubare; Habinyanja; Rushegura near Buhoma; and the Nkuringo group at Nkuringo.